Before :- T.H.B. Chalapathi, J. Criminal Misc. No. 363-M of 1999 and CRL. M. No. 33964 of 1999 (O & M). D/d. 30.11.1999. For the Petitioner :- Mr. Hemant Gupta, Advocate. 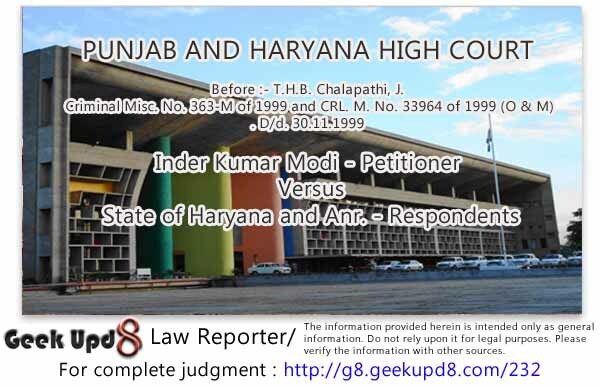 For the Respondents :- Mr. Yashpal, A.A.G., Haryana., Mr. B.S. Walia, Advocate for No. 2. T.H.B. Chalapathi, J. - This petition is filed to quash FIR No. 364 dated 9.7.1997 registered at P.S. Sadar Palwal, Distt. Faridabad. The complainant is a Co-operative Sugar Mill. The petitioner agreed to lift Bagasse from the complainant-Mill @ Rs. 30/- per quintal and accordingly lifted the same and gave some post-dated cheques, which have been dishonoured. In respect of the dishonour of the cheques, the complainant filed criminal case under Section 138 of the Negotiable Instruments Act. They also made a report to the police, which was registered in FIR 364 dated 9.7.1997 alleging that the petitioner committed an offence under Section 420 IPC. To quash the said FIR, this petition has been filed under Section 482 Code of Criminal Procedure. 2. Learned counsel for the petitioner contended that since the complainant already approached the criminal Court by filing a complaint under Section 138 of the Negotiable Instruments Act in regard to the dishonour of the cheques, further registration of the FIR for the offence under Section 420 IPC does not lie. I am unable to agree with this contention. The offence under section 138 Negotiable Instruments Act is completed when once the cheque issued was dishonoured, and the said dishonour of the cheque was brought to the notice of the drawer of the cheque whereas for the offence under Section 420 IPC, it is necessary for the prosecution to establish that the accused has no intention of paying anything for the quantity that he has lifted and with the intention and being knowingly that cheques would be dishonoured, issued cheques which were ultimately dishonoured. Therefore, ingredients of Section 420 IPC and Section 138 of the Negotiable Instruments Act are quite different and they act in different spheres. 3. Learned counsel for the petitioner further contended that the complaint given by the complainant does not disclose commission of offence under section 420 IPC. It is clearly stated in the complaint, which forms the basis of registration of case in FIR 364 that the Directors of Kamla Syntex (petitioner) have intentionally and dishonestly issued cheques with a clear motive to cheat the sugar mill, thus they have committed the offence. "It is not necessary that a complainant should verbatim produce in the body of his complaint all the ingredients of the offence he is alleging. Nor is it necessary that the complainant should state in so many words that the intention of the accused was dishonest or fraudulent. Splitting up of the definition into different components of the offence to make a meticulous scrutiny, whether all the ingredients have been precisely spelled out in the complaint, is not the need at this stage. If factual foundation for the offence has been laid in the complaint the court should not hasten to quash criminal proceedings during investigation stage merely on the premise that one or two ingredients have not been stated with details for quashing an FIR (a step which is permitted only in extremely rare cases) the information in the complaint must be so bereft of even the basic facts which are absolutely necessary for making out the offence." 5. In view of what has been stated above, I do not find any merit in this petition. The same is, therefore, dismissed. 6. However, if any challan is presented against the petitioner, it is always open to him to raise all the pleas that are available to him under law before the trial Court.